Situated just yards away from The Quay and tucked away behind the Blakeney Hotel next to Blakeney time share office, this delightful holiday home offers something for everyone. With all its rooms arranged on one level it is ideal for those who prefer not to negotiate stairs and with its lovely enclosed garden is great for families too. Weybourne Lodge has recently had a fantastic new kitchen fitted as well as superb new bathrooms. It has three bedrooms sleeping five in total, all with coordinating linen and towels, cushions and throws and one with an en-suite shower room, plus a family bathroom. The kitchen is well equipped with dishwasher, fridge/freezer electric fan oven, halogen hob and microwave and it links through to the sitting/dining room. There is plenty of crockery and bake ware so keen cooks can take advantage of the wonderful local ingredients! The light, airy sitting room has a dining area LCD T.V. with FreeSat recorder and DVD player, solid fuel burning stove and 2 large patio doors open out into the delightful garden. This is fully enclosed with a lawned area and mature flower borders and in the distance, a glimpse of the sea. There is parking in its driveway for one car and all the amenities of beautiful Blakeney are within easy walking distance. Weybourne Lodge has wheelchair access. 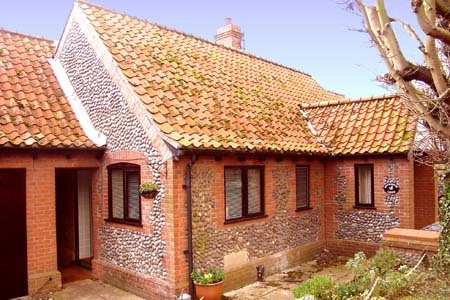 Please contact the office on 01263741777 or bookings@blakeneycottagecompany.co.uk for more information.